Scrapyard Challenge in GTA Liberty City Stories. Scrapyard Challenge is a side mission in Grand Theft Auto: Liberty City Stories. 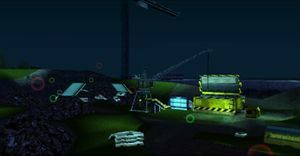 The Scrapyard Challenge starts after the player hops onto a Sanchez at the Harwood Autocrusher and Junkyard, at the south side of a wooden building. It is similar to the Dirtring and Kickstart missions from Grand Theft Auto: Vice City and Grand Theft Auto: San Andreas, respectively, in that the player uses a Sanchez to collect coronas around the track. The goal is to score more than 21 points by collecting coronas dotted around the track in under two minutes. Green coronas are worth one point, yellow coronas two points, and red coronas three points, the points denoting apparent difficulty. The reward for scoring more than 21 points is that vehicles are valued eight times more than normal at the crusher. With 19 coronas, the maximum possible score is 40. This challenge is required for 100% completion. The name of the mission is likely a reference to the British game show Scrapheap Challenge. Dirtring, GTA Vice City equivalent. Kickstart, GTA San Andreas equivalent. This page was last modified on 4 March 2015, at 01:35.